Dungeon synth did not emerge out of nothing. Mortiis admitted in interviews that he was inspired by fantasy novels, and Burzum's influence from Norse mythology and Tolkien is well known. It's no secret what tremendous influence Tolkien had upon black metal, and it is from that specific place in black metal that dungeon synth grew out of, so to speak of the genre without mentioning its literary connections would be a tremendous disservice to it. In fact, its entire substance is based around evoking fantastic images unique to the listener's mind, and as one hears those strange atmospheres, it seems they practically beg to be written. As one would expect, there's far more written work out there that parallels the dungeon mood than just The Lord of the Rings. For that reason I will be making occasional posts that deal with certain works I've found to almost come from the same mysterious horizon as this music. I can see the castle clearer now, and the paths that lead to it, though they shineth but dimly." The single most important written work to this genre, apart from Tolkien's material of course, is probably unknown to most of its listeners. 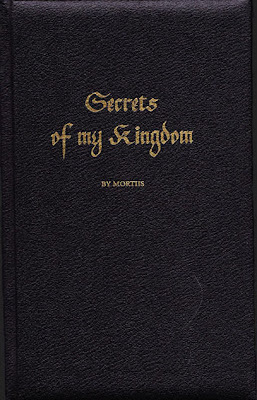 Mortiis, shortly before abandoning the vision for industrial/pop music, published a collection of poetry and prose that he had been writing throughout his Era 1 period. The leather-bound book was published in 850 copies by Earache, and was called Secrets of my Kingdom. Clearly this work was to Mortiis' music what The Silmarillion was to Tolkien's Lord of the Rings, proving what many listeners likely suspect, that Mortiis' fantasy was truly a fleshed out world rather than a general concept. It's unfortunate that this book is so difficult to come by (and expensive), as I feel it often does a better job of expressing Mortiis' vision than the music itself, and certainly gives the listener a much larger context in appreciating it. Is the writing good? In terms of the actual craft, it wouldn't stand on its own next to "respectable" literary works. There are grammar and spelling mistakes everywhere and it is filled throughout with a hokey, pseudo-Old English wording; however, all of this should be easily forgiven by one who understands the music, as these things cause the writing to be charming in the same way that lo-fi recording quality and lack of musical knowledge/experience affect dungeon synth; it is that shoddy, natural, instinctive approach to creation that reminds the reader that the art they are appreciating is real, that it originates from a place of pure inspiration. And like the music itself, the weakness in technique proves to be no obstacle in allowing the ideas themselves to surge forth, dead serious in the romantic escapism, with a pure, naive faith in one's personal vision that so often seems to be found in the artwork of undeniably young and "immature" creators. For here wander always the spirits of dreams, the all-wise, all-knowing... For what reveal not the dreaming mind?" A few full samples from Mortiis' obscure tome can be found here. Thank You. This is a beautiful review. I wish more people could understand what Mortiis created.